Powerful desktop PCs are widely deployed, color graphical displays are standard, and the Internet is rapidly expanding. Because of this information infrastructure, the paperless office is a goal of many information professionals. The look and feel of the paper form is preserved. This reduces design and training costs, and allows users to gracefully migrate from paper to electronic forms as needed. OneForm HTML electronic forms (sometimes called Internet forms) work great with all the popular Browsers. Fillable E-forms and PDF forms can be linked together, connected to databases, e-mailed, and electronically signed and secured. 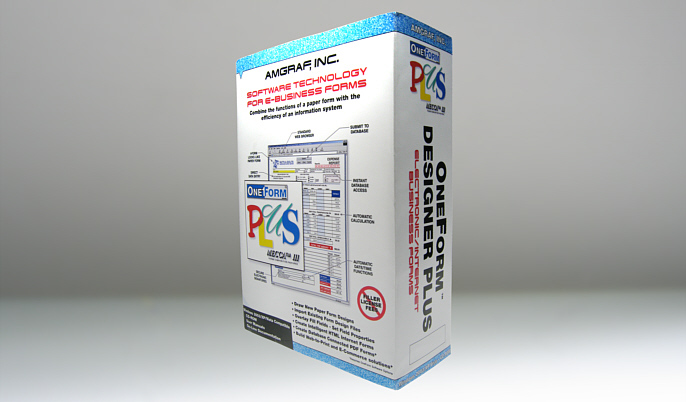 No client-side filler-license software or license fees are ever required to use electronic forms created with Amgraf OneForm Designer Plus. OneForm Designer Plus is a complete e-forms authoring tool, with features for the most demanding workflow projects. Because no filler licenses are needed, it is also the most affordable solution for enterprise-wide electronic and/or PDF forms deployment. Import an existing form design file from a desktop publishing system via the PDF interpreter. Draw a new form using the OneForm graphical tools. Copy a form from the OneForm Forms Library, then edit the form by adding personalization and logos. What is Better - HTML or PDF? HTML electronic forms are great for use where Internet or Intranet access is available. The client does not need to have any pre-loaded Reader software because everything works within the browser. E-forms open seamlessly (without the need for plug-ins or helper applications) and the user can fill and print the e-form on-demand. When clients are connected to the Internet (or Intranet), filled e-forms are saved in databases on the website server. For disconnected users, Amgraf provides OneForm Manager Lite, a free desktop forms manager that supports local filling and saving of e-forms. Fillable PDF forms are ideal for printing, because the graphic design specifications are embedded in the PDF file. OneForm Designer Plus supports the best utilizations of e-forms using HTML and PDF technologies.